In addition to being an all around studio and programming wizard, DiViNCi (from Orlando, Florida) is also constantly raising the bar for his own live performances by being among the few to use a sampling/drum machine as an instrument rather than a tool. DiViNCi always uses two MPC2000XLs (his weapons of choice) to freely mimic any sound, style, or instrument fulfilling his need for a new embodiment of Free Jazz. As a huge fan of improvisation, you may never know what to expect from a DiViNCi performance, but you can always count on him to go all out, often resulting in an overwhelming emotional and physical experience. “PUSH Beat” was taken off DiViNCi’s Beat album “Peacez 2 Be & Instru.Frag.Mentalism”. Much like most of his other compositions everything from this track was played live or sequenced on the MPC2000xl. It actually had to be created on two MPCs for it to be heard correctly. The main distorted sound that is the driving force of the whole track is actually separate upright bass samples. DiViNCi tweaked and affected them so much that the sound that you now hear in the track is so dynamically abrasive that it would drown out any other sound coming out of the same MPC. So all the drum, synth, and percussion sounds had to be playing on a separate MPC for them to be heard. “PUSH Beat” is also one of the tracks that DiViNCi uses his signature MPCynth for a solo towards the end. The synth sound you hear is actually made within the MPC out of a snare sound. The B-Side “Calm Persuasion” (which was originally titled “Ruff House”) can also be found on DiViNCi’s instrumental album. The style and sound of this track are a departure from his usual MPC-heavy compositions. Here, DiViNCi uses drum sounds that were originally tweaked from weird noises he made with his voice, while everything else in the song was written on keyboards. 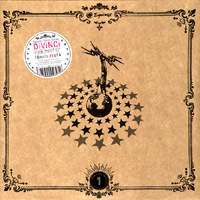 Both tracks on this vinyl debut allow DiViNCi‘s style to shine through with an organic, soulful, and, yet, experimental appeal. He is right up in front blazing the trail with the likes of Prefuse 73, RJD2, and Andrew Broder. And if you doubt DiViNCi’s credibility, consider some of the high caliber hip-hop artists he’s shared the stage with: KRS-One, Atmosphere, Pharoahe Monch, Jungle Brothers, Black Sheep, Phife Dawg, Lyrics Born and Sage Francis. So run, don’t walk, to the record store – this release is very limited to 500 copies worldwide!! Better get it now!